Asianmacro was formerly a bank proprietary trader and hedge fund manager but is now a beach bum managing his own wealth. Besides deciding what to have for lunch (or hitting the gym sometimes), he is mostly found listening to loud music while trading and investing for himself. *While every care has been taken in preparing the information in and/or materials, such information and materials are provided “as is” without warranty of any kind, either express or implied. In particular, no warranty regarding accuracy or fitness for a purpose is given in connection with such information and materials. The opinions expressed do not constitute investment advice and independent advice should be sought where appropriate. In no event will Asianmacro be liable to you for any direct or indirect or any other damages of any kind arising from or in connection with your reliance on any information in and/or materials attached herewith. Asianmacro may already have or intend to have a trading or investment position in the financial instruments or products referred to in this communication. This is not intended as an offer or solicitation for the purchase or sale of any financial instrument and Asianmacro may also have interests different from or adverse to your interests. Good morning, instead of FANG stocks in 2015, we might be looking at LEAF (LinkedIn LinkedIn earnings, Expedia Expedia earnings, Amazon Amazon earnings & Facebook Facebook earnings ) now in short term where they all spiked more than 10% on better earnings & outlook. Yesterday’s BOJ meeting that didn’t come out with anything new seems so distant now as $/JPY came off in jiffy from 111.55 to 107.36 with NKY from 17555 to 16120 presently. While Japan is still mired in finding a sustainable solution to its problems, I’ve taken off all my shorts established in $/JPY & NKY as discussed earlier in week where we were clearly at the higher end of the range in our new bi-modal distribution world where prices gap between the 2 nodes and we’re now at the lower end node. However, I’ve established shorts in Dow futures at 17950-970 past 36hrs before BOJ & added last night at 17910-30. This is in addition to a broken put fly in S&P500 May20 expiry 2025/1975/1950 where it make sense for a 5-6% correction lower post earnings as players head towards summer in cleaning the deck. Also managed to buy some GBP/AUD cross at 1.9050-65 yesterday in the correction lower from 1.9230 .. something that I was recommending looking at 1.8830 before the sudden poor Australia CPI figures 2 days ago caused the sudden spike higher & 1.97-1.99 looms next in GBP/AUD! Good morning, so Apple http://www.marketwatch.com/investing/stock/aapl & Twitter http://www.marketwatch.com/investing/Stock/TWTR?countrycode=US disappointed with earnings & down -9% & -13% in after markets trading. With AAPL one of the most widely held stocks by hedge funds, the pain continues for whole sector. Only Goldman & Morgan Stanley relatively still upbeat on oil with GS analyst on CNBC propping it http://www.cnbc.com/2016/04/26/big-oil-may-have-to-cut-dividends-goldmans-jeff-currie.html saw S&P500 & Dow supported ahead of FOMC decision early tomorrow Asia morning. GBP squeeze rally continued with spike to 1.4635 as Brexit odds reduced by London bookmakers. 1.47/1.48 is not unthinkable as poor crowded GBP brexit shorts look to exit as odds reduce further http://www.bloomberg.com/graphics/2016-brexit-watch/ … GBP/AUD cross does seem to bottom at 1.84 last Friday & a medium rally to 1.97-2.01 seems plausible noting that GBP/AUD has almost 90% correlation to VIX & general risk off … is this an early leading indicator? Asian telecommunication companies (telcos) have long enjoyed oligopolistic hold in their respective markets in the past 2 decades when Asians found their love with mobile phones, internet broadband & cable TV. From the normalised (adjusted to USD) chart above (encompassing Singapore, Malaysia & Hong Kong telcos & cable operators), since the 2008 financial crisis, they have managed to performed very well indeed given their phenomenally stable earnings & relatively high dividend yields averaging 2.5 – 5% in general. However, all good things must come to an end, sometimes it is some disruptive technological change or advance that renders certain businesses and processes obsolete. We have seen that with the steam locomotive, polaroid instant snaps, Xerox copiers, pagers, … the list goes on. The roll-out of 3G-4G networks and fast breakneck fibre broadbands across Asia encouraged the growth of social media, peer-to-peer streaming & other usage of applications that are able to harness the tremendous speed & connectivity into the last mile into Asian consumers’ homes & even when they are on the move. However, the country / domicile walls that these oligopolistic Asian telcos & cable operators have enacted in the past with their respective government support are crumbling down fast! The key is that there are serious dearth of unique domestic content & services provided by all these Asian telcos & cable operators. Most contents, apps and media come from the West or recently from China, Korea & Japan that all the Asian operators syndicated, bought or licensed from. This extends to the current FIFA 2014 World Cup that has enthralled all viewers around the world. The ridiculous price that Singapore football fans have to endure to watch the World Cup matches http://www.goal.com/en-sg/news/3880/singapore/2014/03/18/4690244/singapore-costliest-place-to-watch-world-cup is a case study of what has gone wrong in ”paying based on where you happen to live” when it can be free or much cheaper even within other Asian countries. Asianmacro has been using a VPN service so that he can simply be in the USA, UK, Europe, Latin America or any other country he fancies as identified by his IP address & gateway / DNS to provide security for his online activities. The fringe benefit to this is I have access to watch all the FIFA 2014 World Cup matches for free in those countries that provide free viewing to residents in them too (where Asianmacro will be simply be there by choosing to be there online)! I have taken profit on my long position in Asian telcos like Singtel recently. While I am not going short these stocks as they pay relatively high dividends that many yield hungry investors do chase, the question that we should be asking is whether Asian telcos really have a future besides being “dumb pipe” gateway providers in communications & media, without any real innovative apps or unique domestic content that people want & will pay for! Asianmacro had previously called for a continuous rally in S&P500 when it was at 1880 around May 24 and it has advanced almost 4% since https://asianmacro.com/2014/05/24/path-of-least-resistance-is-up/. Back in May, many doomsayers were on CNBC and various media calling for an impending collapse of even 10-15% in stocks. But looks like the shorts and underweights in equities and bonds were all forced to scramble and had to catch up with their benchmarks that they are underperforming against. However with the impending Full Moon on June 13 and the onset of the FIFA2014 World Cup, I am now calling for caution. Generally, stocks tend to perform better in the days around the New Moon, while price weakness is often seen in the days around Full Moon as seen in the chart above. 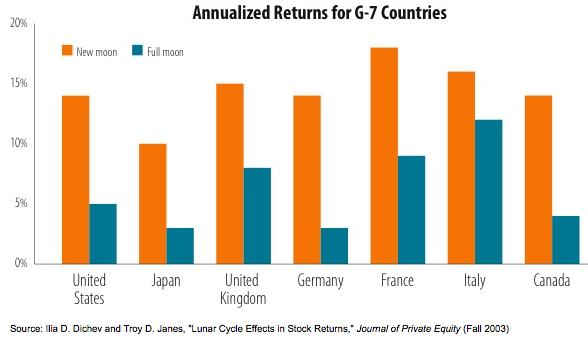 Many research have touched upon this topic like this here http://papers.ssrn.com/sol3/papers.cfm?abstract_id=281665 and an example of lunar-cycle trading by other traders can be found here http://lunatictrader.com/?Moon_Cycles:Lunar_Phases and http://www.ftsefreedom.com/2012/08/how-moon-affects-trader-sentiment-and.html. However, another indicator which is the USA Federal Reserve Money Supply M2 yoy growth that I track to give me an idea of the pace of liquidity creation in the US monetary system. It has peaked in 2012 in spite of further QE which has propelled the equity markets higher. M2 in itself don’t mean much but belongs to an array of economic & other market indicators which I track. While we might see S&P500 ending higher and maybe even cross 2,000 level by December 2014. But Asianmacro will take his chips off the table for now, pour himself a glass of nice burgundy, followed by a fabulous single malt whisky and watch the FIFA2014 World Cup action unfold. The market is now left to the losers who need to be around. Not me! Asianmacro has many close friends in the ”real world” i.e. people who are engaged in real productive businesses or employment like doctors, engineers, businessmen, lawyers (OK maybe not lawyers) …. where FOMC. ECB, QE & other financial lingo don’t mean much to them! However, what you do not know nor care in your regular life in going for work in the morning at 9 a.m., punching out at 5 p.m. (if there is even regular hours anymore like days of old!) does not mean that you will not be affected by events & developments which only financial market practitioners care about to monitor with a hawk eye. In fact since the 2008 global financial crisis, everything that has happened especially in the real world & economy affecting many lives can be traced back to financial markets development & actions taken by governments & central banks since. The most important event coming up with reverberating effects globally with be this upcoming European Central Bank (ECB) meeting on Thursday 5 May. All expectations are on Draghi, the ECB President to cut Eurozone refinance rate and unleash their version of QE as well. http://www.reuters.com/article/2014/06/02/us-markets-forex-idUSKBN0EA11M20140602 . From the chart above, we can see that EUR/USD has plunged from 1.40 to 1.36 currently in the past one over week end May as short positions (*best captured by the IMM CFTC net non-commercial positions) reached the highest level of shorts in 2014. Risk reversals volatility prices (where price of calls over puts) have fallen as well with options market pricing more demand for EUR puts over calls. In the chart below, in fact, Citigroup Pain Index is at an extreme negative level. This is a FX Positioning Alert Indicator that infer positioning of active currency traders from relationships between exchange rates and currency managers’ returns. A positive reading suggests that currency traders have been net long the currency and a negative reading suggests that currency traders have been net short the currency, and in this case, the market is extremely short EUR. We can also see that the yield spread between 2-year EUR rates & USD rates have gone to an extreme level since EUR rates fell a lot more & quicker in the recent weeks vis-a-vis USD rates. When the entire sell-side screams for lower EUR & for further short EUR recommendations into ECB meeting, this is when Asianmacro gets worried over the imbalance of sentiments. Sometimes, the markets have no logic beyond street positioning & will go to the maximum pain to squeeze out the weak hands. As such, I have close out my short EUR/USD position & in fact turned long via 3-day EUR 1.3600 strike call options NY cut expiry (NYC 10 a.m. expiry which is right after ECB meeting decision & when the ECB press conference is underway). From illustration below, it cost my only 33 b.p. (or an equivalent of 40 pips in FX terms) with breakeven at 1.3640. If Draghi underwhelms in delivering an ECB cut & tone in his press conference, EUR/USD might just fly up to 1.3750-1.3800 level and I will be a happy man via my options & allow me to re-sell EUR/USD to take profit & establish new EUR shorts if it make sense again. If ECB overwhelms with aggressive cut & dovish undertones & EUR/USD plunge further, I don’t lose much beyond my small option premium for the call option that will expire worthless. Path of least resistance is … UP! There have been many naysayers & dooms -day-prophets in the markets lately. It’s always easy to call for a 10-20% correction in stocks & general markets & saying ‘Sell in May & go away!”. The key is when precisely? And also after all the selling in protecting your downside if you cannot take the temporary marked-to-market pain; when & how are you going to get back onto the financial market bus before it speeds off again without you is key! Sometimes when everybody call for a market correction or move in either direction up or down, usually, it just ain’t gonna happen that way. Just like the past week when calls of 1815 or 1780 in S&P500, a 5% correction to the downside seems imminent … we end up at almost 1900 by the end of the week. Asianmacro likes to look at relative performance of EEM vs SPY (the Emerging Market ETF vs S&P500 ETF) as an indicator of flow of funds between developed & emerging markets whenever the direction of the general market is uncertain. From the chart above, we see that SPY has outperformed EEM since 2010 till January 2014 when it reversed. The biggest components of EEM are the likes of Samsung Electronics (3.93%), Taiwan Semiconductor (2.50%), Tencent (1.88%), China Mobile (1.55%), China Construction Bank (1.31%); where the top 5 names account for about 11% weighting & all are from North Asia. From the chart below, new units creation in EEM have been driving the rally outperformance of EEM evidently. The question now is will we see this continue or we might have plateaued & reverse instead? It does seem that in the short run, perhaps we just might especially if China is relaxing the foreign investment rules http://online.wsj.com/news/articles/SB10001424052702303749904579579670989773760?mg=reno64-wsj&url=http%3A%2F%2Fonline.wsj.com%2Farticle%2FSB10001424052702303749904579579670989773760.html. In addition, EUR/AUD FX cross continues to head lower with VIX and all signs do point to S&P500 crossing & powering higher above 1900 despite the howls of protests by the bears that was touched upon in my previous post on a summer melt-up rally in risky assets https://asianmacro.com/2014/05/13/the-summer-carry-melt-up-in-risk-assets/. Remember, the path of least resistance is … UP … as this is when it’s most painful for everybody who’s gotten off the financial market bus & have not got back in again!